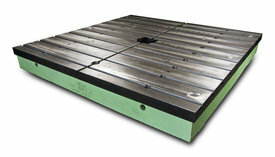 Jash Cast Iron T-Slotted Floor Plates are used in engineering industries as rigid bases for layout, marking, inspection, assembly work, large fixtures, special tooling and production set ups, as also for mounting jobs for precision welding or for carrying out machining operations like drilling, boring etc. 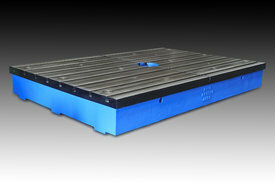 and also as test beds for mounting engines, large machines, transmission or other industrial equipment. JASH is a leading manufacturer and supplier of Light & Medium Duty (ELMD Type) Clamping plates suitable for use as tables or beds for light duty work like layout, marking , inspection, testing, assembly, set ups, light fabrication etc. These are machined on top bottom and two longitudinal edges. Ends are machined only upon request. 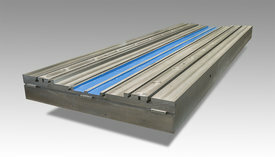 These T-Slotted Floor / Bed plates can be encased into concrete by filling grout material underneath the plates. Turbine Assembly & Testing at ABB, BHEL & Sulzer Flovel. Generator Assembly & Testing at ABB, CG-Elin, L&T MHI Turbine, Andritz Hydro. Transformer core stacking & assembly at TELK, Crompton Greaves and ABB. Motor Testing at Crompton Greaves, GEC Alstom, Kirloskar Electric, Siemens, Jeumont, ABB, NPCIL, Reliance, Marathon Electric, etc. Engine Testing at Maruti, DCM Daewoo, Eicher, Bajaj, Mahindra & Mahindra, Tata Motors, ARAI, Honda Cars. Pumps & Compressors Testing at Bharat Pumps & Compressors Ltd, Torishima, Tushako and Burckhardt. Large Gear Box Assembly & Testing at Flender Macneil Gears. Fluid Couplings Testing at Fluidomat & Pembril Fluid Drive. 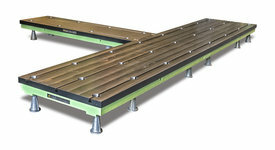 Dynamoter Testing Beds for SAJ Froude Test Plant, AVL, Horiba. 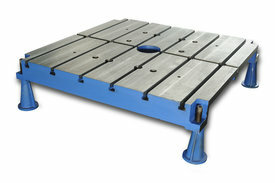 Dynamic Balancing Machine Beds for Schenck Avery. Machine Beds at Maruti, L&T, ABB, Soraluce,L&T MHI & Tata Motors. Boiler Fabrication Plates at BHEL, Thermax, ACC Babcock & L&T MHI. Heavy Fabrication Plates at L&T, Triveni Structurals, Bharat Heavy Plates & Vessels. 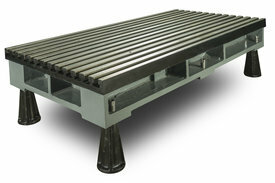 Slab Caster Beds for SAIL Bokaro & Bhilai Steel Plants and also at TISCO. Naval Fabrication Beds at Cochin Shipyard, Mazgaon Docks and Naval Projects, Visakhapatnam. Radar Fabrication & Assembly Base Plates at Bharat Electronics Ltd.
Satellite Solar Panel Mould Setting Table for ISRO, Trivandrum. Polar Satellite Launch Vehicle Fabrication Base Plates for VSSC / ISRO, Trivandrum. For Big Horizontal Boring Machine at BHEL Ltd. Bhopal (WTM Department) 15 Mtrs. x 15 Mtrs. comprising of 18 nos. 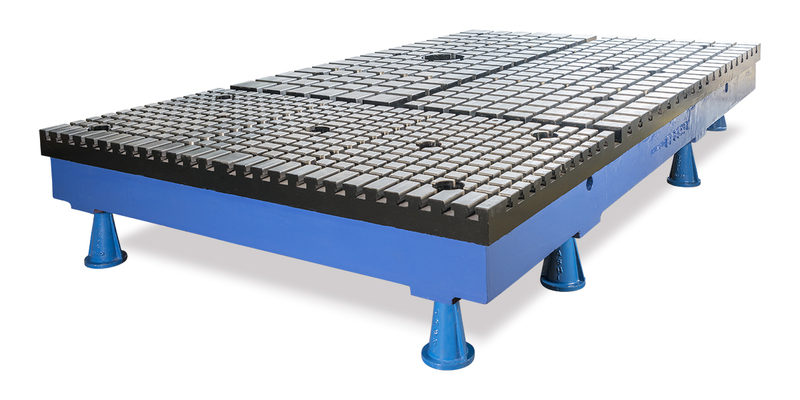 T-Slotted Plates each of 5000 x 2500 mm size with a load bearing capacity of 35 tons per m sq. (a) For Innocent Floor Boring and Milling Machine – 10.4 M x 14 M comprising of 24 nos. plates each of 3.5 x 1.5 M size and 10.4 M x 3.5 M comprising of 6 nos. plates each of 3.5 x 1.5 M size. (b) For Fabrication Area – 12 M x 6 M comprising of 12 nos. plates each of 3 M x 2 M size and 6 M x 6 M comprising of 10 nos. plates each of 3 M x 0.75 M size. (c) Turbine Assembly Area – 45 M x 8.5 M comprising of 105 nos. plates each of 3 M x 0.75 M size. (d) Generator Assembly Area – 6 M x 6 M comprising of 6 nos. plates each of 3 M x 2 M size. 12 Nos. 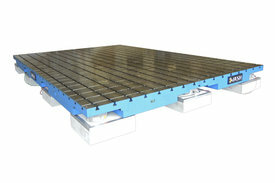 Bed Plate of size 7000 x 2000 x 400 mm of L & T – M H I Turbine Genearators Pvt. Ltd., Hazira, Surat. 2 Nos. Bed Plates of size 6000 x 2000 x 350 mm of Burckhardt Compression India Pvt Ltd.
12 Nos. Bed Plates of size 4000 x 2000 x 300 mm of Daimler India Commercial Vehicles Pvt. Ltd., Chennai. 4 Nos. Bed Plates of size 6000 x 2000 x 350 mm of Crompton Greaves Ltd., Mandideep, Bhopal. 2 Nos Bed Plates 6000 x 2000 x 250 mm to make overall area of 6000 x 4000 x 250 mm of Cyclect Engineering Singapore with Air Sprint mounts. With such an excellent track record JASH is the name which is most trusted by the leading industries in India for their requirement of T-slotted Floor / Bed Plates / Base plates, wherever metal is formed, shaped or welded, machines are built and engines / electric machines are tested. Cored and ribbed construction, made from close grained plain cast iron Grade – FG:200-IS:210 (equivalent to GG20 / FT 20 / 30-A), having hardness within 160-220 HB. Also offered in higher grades of casting upon request. Smooth machined or rough ground or rough scraped or fine hand scraped surface finish as may be necessary to obtain desired flatness accuracy or as specified by the buyer. Flatness accuracies as per IS-10602 can also be offered. Flatness accuracies measured using precision electronic level for high precision applications, can be offered at extra cost. Special work mounting and locating features like mounting and positioning holes, scribe lines, grooves, one T-slot and one side face provided accurately straight to serve to serve as references etc., can also be offered upon request. Pockets on top of plates, to house bolts for interconnection of similar plates meant for obtaining larger overall made up size. Stand mounting type with leveling screws either accessible from top or from bottom, as required. 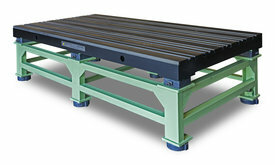 In case of non-standard sizes, clients are requested to furnish information like (a) length, width and height of plate (b) load bearing capacity required (c) type of intended use (d) whether floor mounting type or stand mounting type (e) flatness accuracy of top working surface (f) size, number and pitch of T-slots (g) T-slot tolerances.